Nothing better than a delicious, frozen smoothie to get refreshed in the hot summer days. Papaya is a juicy and sweet tropical fruit that always brings me amazing childhood memories from Brazil. My mom used to make papaya smoothies for my sister and I all year long. We lived in a very tropical city and for this reason, papaya and coconut were found easily everywhere you went. When I moved to Canada, I was glad to see all these fruits here as well. But I’ve got to be honest, sometimes the mangos, papayas, and pineapples are not as sweet and tasty as they are in South America since they are picked before they are ready to the consumer. It must be picked this way before they travel a long way to come here. Otherwise, they would arrive rotten. But I still enjoy tropical fruits here in Canada and I always try to add them into my meals. 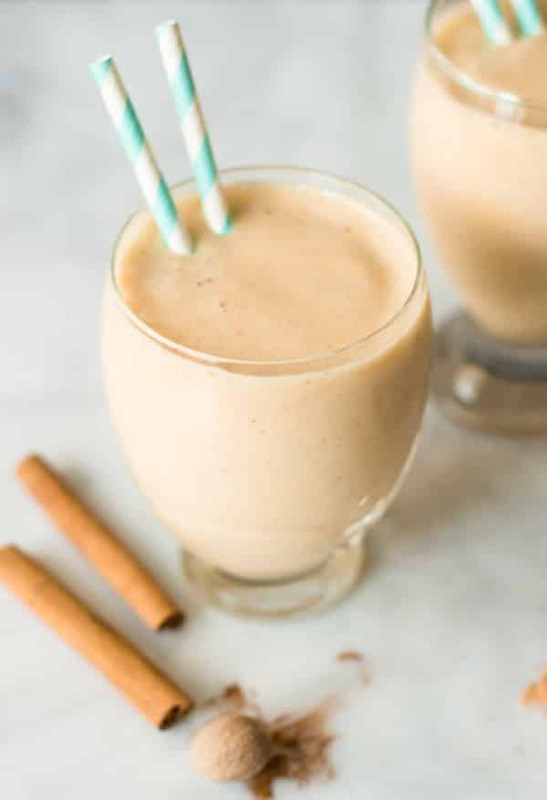 About the recipe, I never add sugar in any of my smoothies and other recipes like my peanut butter waffles and peanut butter chocolate chips pancakes because some of the ingredients of these recipes already have a natural sweetness such as fruits and coconut milk. But, of course, if you prefer a sweeter smoothie, you can add 1 or 2 tablespoons of sugar. 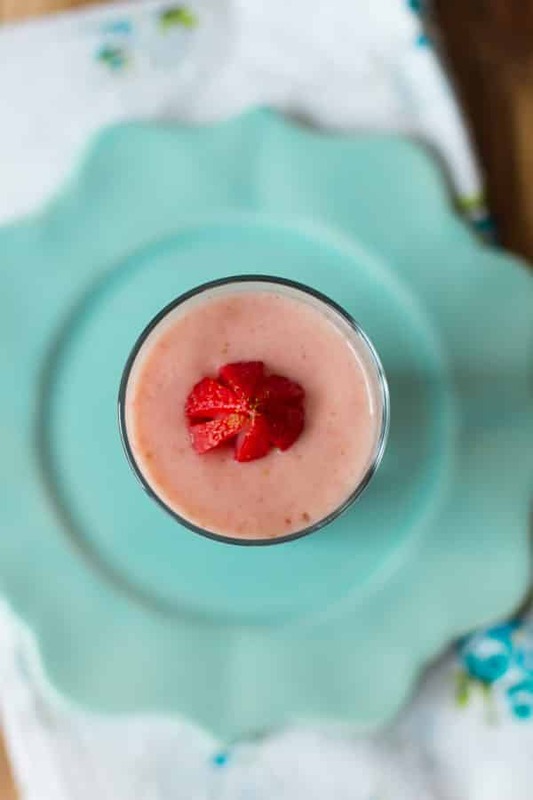 If you like this Strawberry Papaya Smoothie recipe, please share with your friends and family. Do you want to taste more? Subscribe to my newsletter and follow Primavera Kitchen on Twitter, Pinterest, Google+, Instagram, and Facebook for all delicious recipes updates. As always, I really appreciate you stopping by. Thanks a lot for coming over today! What about a delicious Spicy Pineapple Peach Smoothie for your breakfast? This looks delicious and dairy-free! 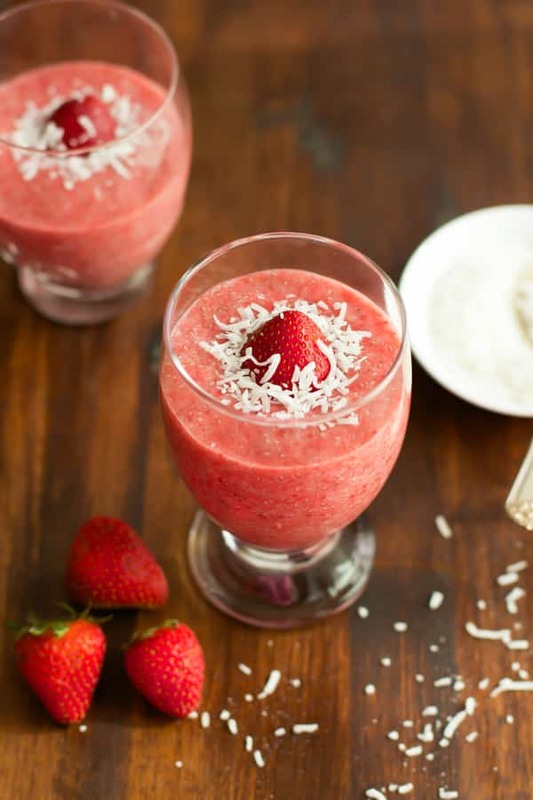 And what about have this Strawberry Coconut Chia pudding! It is the easiest and healthy recipe ever. 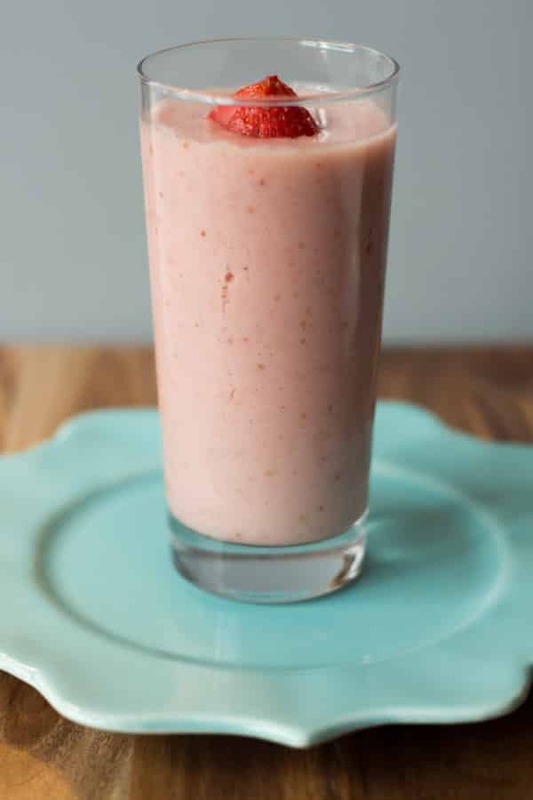 It is made with chia, coconut milk, and strawberry! Gluten-free and dairy-free! I love the looks of this smoothie! What a great idea to add papya in…definitely gives regular ‘ole smoothies a fun twist! i have a strange relationship with papaya, some days I love it and some days I can’t stand the smell of it. 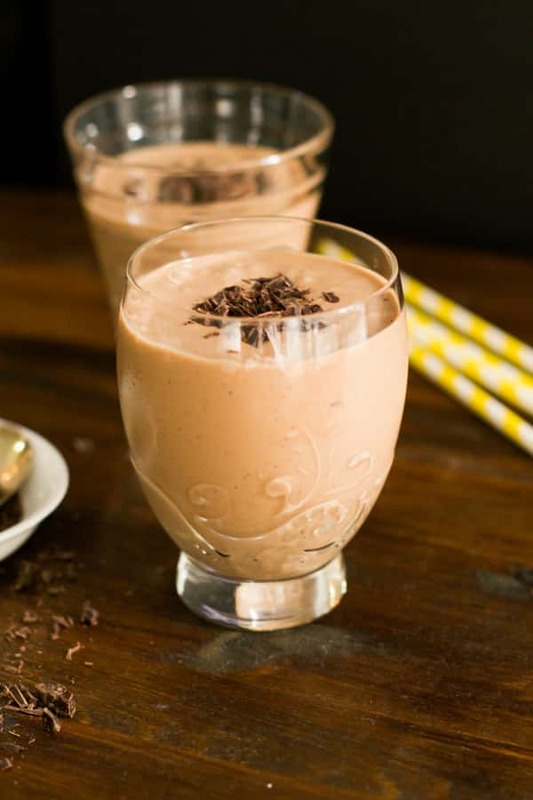 You are making me love it right now with this smoothie recipe. It’s also super healthy. Can’t wait to make it. ahhahahaha… my sister always complaints about the smell of papaya too 😉 So glad you love it. Thanks a lot for stopping by! 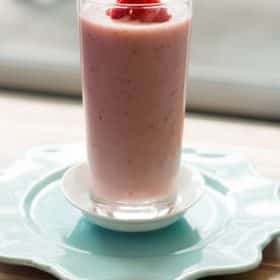 This smoothie looks so delicious, creamy and that strawberry on the top! Gorgeous!! I’ve never had a papaya before, but I think it time I try one. This smoothie looks absolutely delicious and refreshing. I’ve been loving smoothies lately and I also love seeing all the delicious and creative smoothie ideas that other people come up with! I love papaya and I am sure it tastes great in a smoothie! I need to find some asap! Smoothies are great for summer, right? Try papaya and strawberries. Delicious combo! Love papaya but have never had it in a smoothie before. What a great idea and it sounds delicious with the strawberries and coconut milk. Looks so refreshing and tasty! Hope you had a wonderful Canada Day on Tuesday! It must be just so lovely to have perfectly fresh tropical fruit like papaya available all the time. 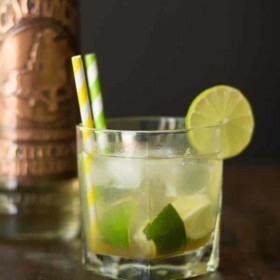 I was just reading about Brazilian fruit juices the other day – they sound amazing! This looks delicious and healthy! Your pics are just beautiful! I usually use mango in a smoothie, but the papaya sounds like a fun change. Coconut milk is my favorite in all my smoothies. Thanks for the recipe – pinning it now! This smoothie looks amazing! So refreshing and delicious. 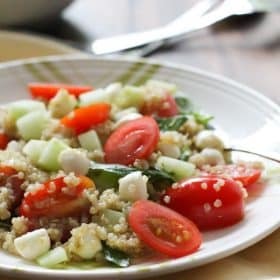 Would make an amazing light Summer breakfast! Oh this smoothie is calling to meeee! When I was in the Dominican Republic a couple of weeks ago, I ate my weight in papaya and mango. I’ve been missing the tropical fruit dearly. 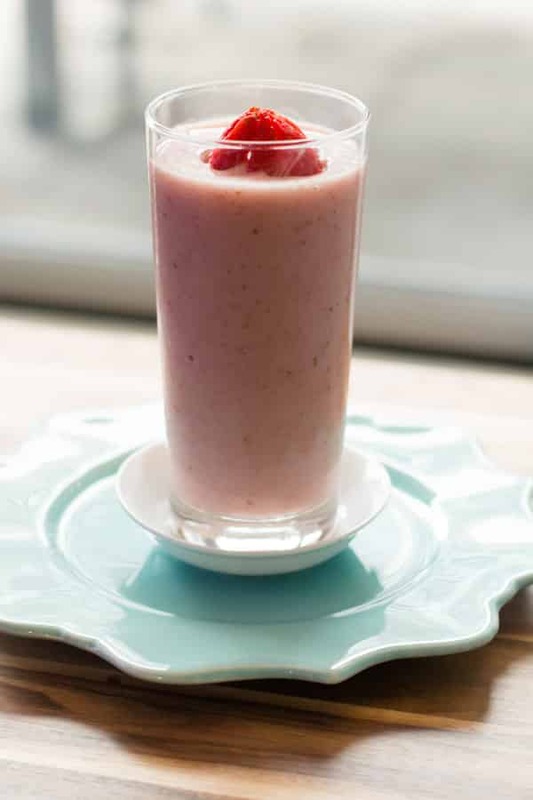 This smoothie looks delicious and would bring back those fond tropical memories. P.S. Cinnamon with papaya?? GENIUS!! I’m a tropical fruit FIEND and eat them wherever I can get ’em. This sounds like such a refreshingly lovely smoothie! So glad you like it, Joanne! I love papaya – haven’t seen any around here yet but I am looking out for it! I love that you used coconut milk in this! I bet this has a delicious, tropical flavor. I love smoothies, favorite summer breakfast. Great to cool off before a hot day. Please, try this combo, Arpita. I am sure you will love it. So good! Loved the smoothie, but found it was a little thick, I ended up adding some unsweetened iced tea I had brewing in the fridge to ‘thin it out’ a little. I used all frozen fruit though. Loved it and will be making more for the kids when they get home from school today!